On September 11, 1944 American soldiers crossed the German border north of Trier and had arrived at the Siegfried Line, east of Aachen. By the 12th of September 1944, the first pillboxes of the Siegfried Line were taken. The Allied forces had reached the Siegfried Line 96 days after landing in Normandy. This placed them well ahead of the 330 days originally scheduled by logistic planning. Instead of the estimated arrival date of May 2, 1945, they had reached their objective by September 12, 1944. This unexpectedly fast advance had outstripped supplies and ground the American Army to a halt until such time as supplies could catch up. VII Corps (US) threw its weight to crack the defenses of the world-famed West Wall in the area south of Aachen. The 3rd Armored Division received orders to attack south of Aachen. This relatively open, tank-favorable terrain was designated by the Americans as the Stolberg corridor. It favored the attack of larger mechanized forces. The attack of the 3rd Armored Division advanced only slowly. On German side the LXXIV (74.) Armeekorps strove to strengthen and try to hold the front in the section of Aachen. This was done in order to use the Siegfried Line as long as possible, with its favorable terrain as a defense. The forest offered the defender the possibility, to reduce the US Air Force superiority and reduced the efficacy of tanks and artillery. On September 16, the German 12 Infanterie-Division arrived, it was assigned to make a counter-attack against Aachen. Parts of the 353. Infanterie-Division occupied the Siegfried Line in the Huertgen Forest. Parts of the 89. 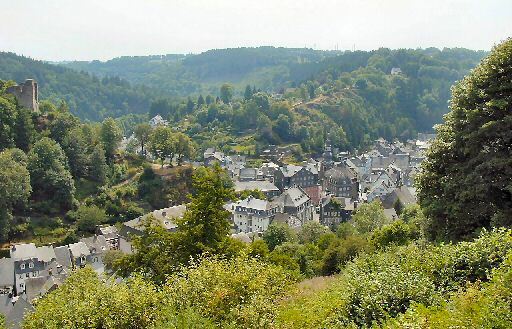 Infanterie-Division were used to defend the area around Monschau. That time almost 239 German armored vehicles and assault guns faced at least 2,300 on the Allied side, thus almost a ratio of one to ten. After their success in Arnhem (MARKET GARDEN), the Germans reinforced the Eifel-front to prevent an allied break-through to the RHINE and to maintain the marching space for the Battle of the Bulge, which was in its first planning phase. The German 275. Infanterie-Division stood opposite the 9th Infantry Division, which had orders to capture the high ground around Schmidt. Hence the right flank of the VII-Corps was secured. After the capture of Schmidt, the Germans in the Monschau corridor, who toughly defended their Siegfried Line, were seized from behind and were eliminated. After a barrage of artillery fire over the entire width and depth of the attack area, launched the US Infantry their attack at 11:30 on October 6, 1944. The attacking American infantry suffered dreadful losses by treebursts. The Germans were protected in their field positions and fortifications. On October 7, 1944 , approximately 100 men of the 60th Infantry Regiment were lost by treebursts, even though they were not engaged in battle. In the forest fight, it was difficult to find targets for the US artillery and US Air Force. The two US regiments had only one main supply route (MSR) to their disposal. Because of the fact that the Germans placed mines and barricades made of tree trunks, neither tanks nor guns could deliver support to the attacking infantry. Parts of the 39th Infantry Regiment succeeded in penetrating the German lines, west of GERMETER, capturing some of the pillboxes. The fights lasted till October 16, 1944, by then both sides were so weakened that the fighting stopped. US terrain gained: about 2.7 km., reaching GERMETER. SCHMIDT remained in German hands. At the end of October 1944, V-Corps was brought into action in the Huertgen Forest area. At 10/26/1944 the 28th Infantry Division relieved the 9th Infantry Division in the Huertgen area. Despite their losses, the German 275. Infanterie-Division stayed in position. The reinforced 28th Infantry Division received orders to push forward into the Vossenack - Schmidt - Lammersdorf area, attacking the Germans positioned in the Monschau corridor from behind. Zero hours was set at 09:00 on November 2, 1944. Due to the fact that it was November 2, the Germans called this battle the "Allerseelenschlacht". Before the attack on Schmidt, the front line extended along the road Huertgen - Germeter - Rollesbroich and from Germeter trough Richelskaul in the vicinity of Raffelsbrand. The partial dense wooded ridges of Vossenack - Huertgen, Kommerscheidt and Schmidt and the Brandenberg - Bergstein ridge, dominated the area. To take these ridges, air and artillery support were needed. However, the weather and the dense forest did not allow the use of air reconnaissance and tactical air support. US artillery units were stationed in the area Zweifall / Roetgen. When the 28th Infantry Division penetrated into this area on October 26, the soldiers encountered a misty, wet and dark forest. In addition what they saw were abandoned and destroyed supply vehicles, bursted trees, forgotten mines, muddy roads and trails, as well as hundreds of shell-craters. From various indications, the Germans expected an attack. However, they didn't know the time and the direction of the hit. 60 minutes before zero hours: heavy artillery barrage. The 112th Infantry-Regiment had to take Kommerscheidt and Schmidt and by occupying Vossenack, they protect their northern flank. The main push was concentrated at the already occupied Richelskaul, over the Kall river, on to Kommerscheidt and finally into Schmidt. The infantry had to be accompanied by moderately armored tanks and antitank weapons. Before action, some mine fields had to be cleared east of Germeter. At 08:00 hours November 2, 1944, at 08.00 hour's, the US artillery came into action. One hour later, the first companies left their positions in Germeter under the protection of tanks. On November 8, the US military stopped fighting. At night the 300 remaining soldiers of the 112th Infantry-Regiment were withdrawn. The 112th I.R. had lost 1,900 soldiers. The total loss of the 28th Infantry Division amounted to over 6.000 men out of approximately 25.000. Just like the 9th Infantry Division in October, the 28th Infantry Division was in November the second division that lost their fighting strength in the Huertgen Forest area. On November 16, the 1st and 9th US Army launched Operation QUEEN, their large-scale attack on the RUR river between Linnich and the Huertgen Forest. On November 28, the Americans took Huertgen, the next day Kleinhau and Großhau were taken. On December 5, the Germans lost their last stronghold at Vossenack. On December 7, Bergstein, with its controlling castle hill (Hill 400) was taken. The road to Düren was cleared when the villages Gey and Strass were taken on December 12, 1944. On December 16, 1944, the Germans launched their massive counter-offensive. This was the start of a battle that was later called "The Battle of the Bulge." This event temporary diminished the fighting in the Huertgen Forest. 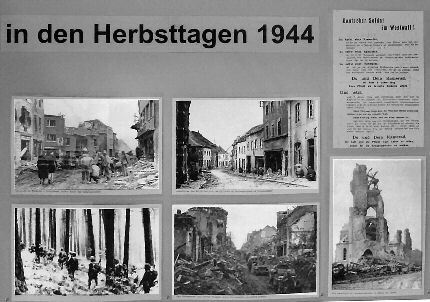 After the Germans had lost their last offensive in the west, the US Army resumed its combat in the Huertgen area on January 10, 1945. Finally Schmidt fell in American hands on February 8, 1945. The next day; the RUR dams were taken. This is how the battle for the Huertgen Forest ended. Approximately 120,000 Americans, plus individual replacements increasing that number by many thousands fought in the battle. More than 24,000 Americans were killed, missing, captured or wounded. Another 9,000 succumbed to the misery of trench foot, respiratory diseases and combat fatigue. In addition, some 80,000 Germans fought in this battle and an estimated 28,000 of them became casualties.